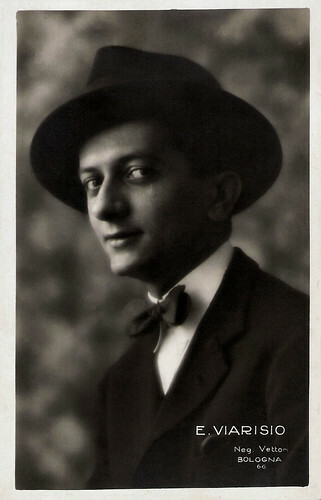 Enrico Viarisio (1897-1967) was an Italian stage and screen actor, and cabaretier. In the sentimental comedies and white-telephone cinema of the 1930s, Viarisio was a constant figure, with his moustache and his black, shining hair combed to the back. Italian postcard by Vettori, Bologna, no. 66. Italian postcard by Ed. Vettori, Bologna, no. 131. Enrico Viarisio, born in Turin in 1897. Equipped with a fine and elegant humour, the 19-years-old Viarisio was discovered by actress and stage company director Paola Pezzaglia, who offered him his first theatrical engagement as in December 1916. He debuted in an adventurous way: as the leading actor had missed the company’s rehearsals, Viarisio had to play all the important male parts. He then specialised in light entertainment and music-hall. From the 1930s he has also worked in cinema, establishing himself as one of the most famous comical actors of sound cinema even if he was almost always relegated to secondary roles or antagonists. Viarisio thus played opposite Elsa de Giorgi in L’impiegata di papà (Alessandro Blasetti, 1933), opposite Elsa Merlini and Vittorio De Sica in Paprika (Carl Boese, 1933) and Non ti conosco più/I Don't Know You Anymore (Nunzio Malasomma 1936), and again opposite Vittorio De Sica in Tempo massimo/Full Speed (Mario Mattoli, 1934) and L’uomo che sorride/The Man Who Smiles (Mario Mattoli, 1936). Viarisio would act in many comedies by Mario Mattoli. By the later 1930s Viarisio had the male leads in comedies such as Musica in piazza/Music on the square (Mario Mattoli, 1937) with Milly and Gli ultimi giorni di Pompeo/The last days of Pompeo (Mario Mattoli 1937). Wikipedia: "Often he remained in the limits of the genre, but in some cases showed admirable creativity in his performances, keeping them fresh and memorable." He also appeared in Il destino in tasca/Destiny in your pocket (Gennaro Righelli, 1938) with Vanna Vanni, Due milioni per un sorriso (Mario Soldati, Carlo Borghesio, 1939) with Elsa de Giorgi, L’eredità in corsa/The heritage on the run (Oreste Biancoli, 1939) with Antonio Gandusio, and L'amore si fa cosí/Love goes this way (Carlo Ludovico Bragalia 1939) with Colette Darfeuil. In the early 1940s he played in Le sorprese del vagone letto (Gian Paolo Rosmino, 1940) with Clara Calamai, and Finalmente soli/Alone at last (Giacomo Gentilomo, 1942) – a kind of Italian variation on René Clair’s Un chapeau de paille d’Italie/The Ialian Straw Hat (1928), with a likewise frenetic protagonist. Viarisio less frequently acted in dramatic films such as Cavalleria/Cavalry (Goffredo Alessandrini 1936), starring Amedeo Nazzari and Elisa Cegani. In Alessandro Blasetti’s proto-neorealist film Quatro passi fra le nuvole/Four Steps in the Clouds (1942) Viarisio is a streetwise travelling salesman like the protagonist Gino Cervi. In these dramas he didn’t have the lead, but was more often a comical sidekick. Italian postcard by ASER (A. Scaramaglia Edizioni, Roma), no. 144. Tirrenia, Photo: Gneme. 1940s. Famous were Viarisio's words in Prima comunione/First Communion (Alessandro Balsetti, 1950). When he, the man from the trolleybus was told: Aren't you ashamed to travel with that bowler hat?, he responded: And you, aren't you ashamed to travel with that face?! Italian postcard by ASER (A. Scaramaglia Edizioni, Roma), no. 267. Photo: Vaselli. 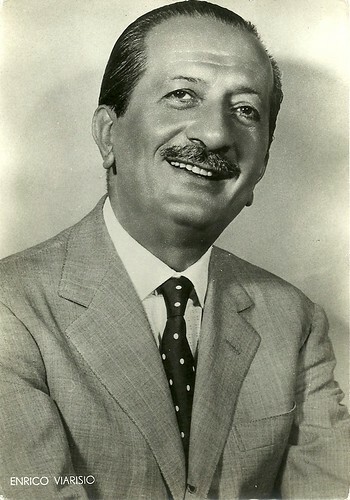 Enrico Viarisio was an elegant and slim character, recognizable by his perpetually pomaded hair and well-groomed mustache. He often played characters of noble decadence or the invading and sometimes annoying bon-vivant, even if basically an honest man. He was often mistaken for his colleague Giuseppe Porelli. Until the end of the war Viarisio acted in some 44 Italian sound films. 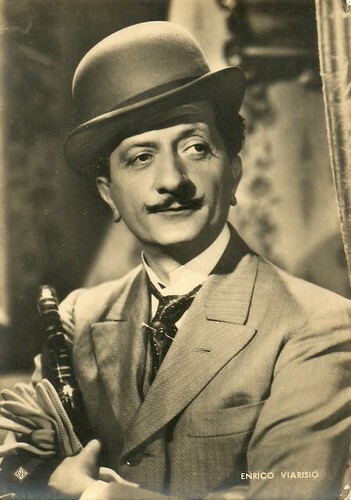 After the war his production slowed down, but in 1950 he played in four films, including the bitter-sweet comedy Prima comunione by Alessandro Blasetti and starring Aldo Fabrizi. The 1950s were as fruitful for Viarisio as the 1930s. He continued his career onstage in revue shows, supporting such artists as Wanda Osiris, Olga Villi and Isa Barzizza. During the 1950s he also played in dozens of genre films, as well as some auteur films including I vitelloni (1953) by Federico Fellini with Viarisio as Moraldo's father, Stazione Termini/Terminal Station(1953) by Vittorio De Sica, Carosello napoletano/Neapolitan Carousel (Ettore Giannini 1954), and La ragazza del palio/The Love Specialist (Luigi Zampa 1957) with Diana Dors. Afterwards Viarisio participated in numerous Musicarelli (Italian teen musicals) alongside famous pop stars (or singers who later became famous), like Mina, Bobby Solo, Gianni Morandi and Rita Pavone. His most famous characterization of that period was that of the commercials shot for Alemagna sweets with Lia Zoppelli and Alberto Lionello, aired between 1957 till 1965 in Carosello, which always ended with the slogan "Ullallà, è una cuccagna!" (Oh-la-la, it’s a goody!). Viarisio's last film part was as a general in Lina Wertmuller's Non stuzzicate la zanzara/Don't Sting the Mosquito (1966), with Rita Pavone and a young Giancarlo Giannini. 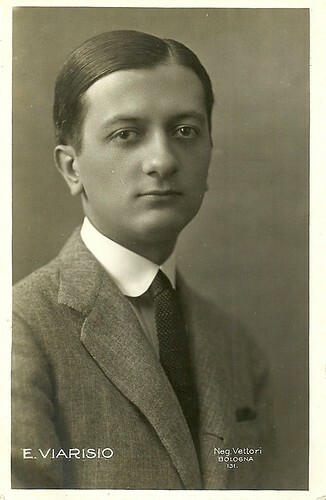 Enrico Viarisio died in 1967 in Rome. He was 69. He was married to Giuditta Marchetti. Italian postcard. Istituto Romano di Arti Grafiche Tumminelli & Co., Roma. 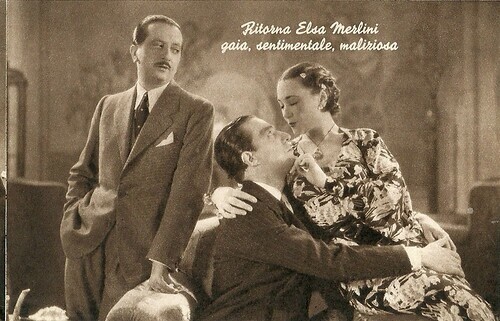 Enrico Viarisio, Elsa Merlini and Vittorio De Sica in the Italian comedy Non ti conosco più (Nunzio Malasomma, 1936). The film was promoted as a return for Elsa Merlini, "gay, sentimental and malicious". Italian postcard by Bromostampa, Milano, no. 379. Carosella Allemagna. Source: Video Babele (YouTube). Source: Wikipedia (Italian and English) and IMDb.